Security forces in Cameroon have been cracking down on street rallies protesting the October 7 re-election of President Paul Biya. To avoid beatings and arrest, protesters have taken their message to safer, even holy grounds such as schools and churches. Opposition protesters sang on Monday in front of the University of Yaounde in the capital of Cameroon. The lyrics say that opposition leader Maurice Kamto won the October 7 presidential election and that longtime President Paul Biya should hand over power. A massive deployment of police stopped the protesters from singing on the campus itself. Twenty-six-year-old teacher Boniface Onana says they will continue demonstrating against Biya’s re-election. He says Biya should know that the time he was ruling Cameroon with an iron fist, using divide and conquer tactics, is over. Onana says Cameroonians should know that a new nation with a new leader has been born and he will do everything possible to pass on the message. Police say they detained four of the protesters and are investigating others who ran onto the university grounds disguised as students. Opposition supporters are seeking safe areas to protest as Cameroon security forces have been cracking down on street rallies since the election. 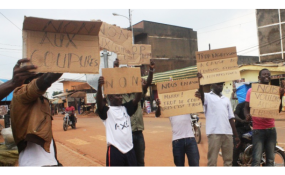 Tens of protesters on Sunday entered the Our Lady of Victories Cathedral in Yaoundé, interrupting a service to sing that Biya should hand over power. Sosthene Lipot is the information officer for Kamto’s Cameroon Renaissance Movement party. He says they took their protests to the university and the church because of the crackdown. He says the military should know that Biya has not even won wars he declared on two fronts — against Boko Haram and against separatists fighting for the creation of an English-speaking state — yet he is sending his military to attack innocent people who are simply protesting for their rights. Archbishop Jean Mbarga condemned the protesters who entered the church, calling it a desecration of a religious body. He says the Yaoundé archdiocese is scandalized at the disrespect that some politicians have shown towards the church. He says the church is apolitical and should never be used for any political activity, reason why he totally condemns such acts that are instilling doubts in the minds of Christians as to the neutrality of the Catholic church. The Roman Catholic church in Cameroon has issued conflicting comments on the presidential election. Mbarga on Sunday saluted Biya as the winner, while the head of the national Catholic bishops conference expressed suspicion at the official results. Officials said Biya won the election with 71 percent of the vote. Kamtos, his main challenger, received 14 percent. Opposition parties accused Biya’s ruling Cameroon People’s Democratic Movement (CPDM) party of massive electoral fraud.